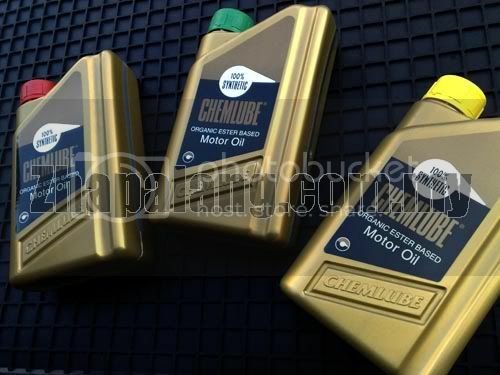 CHEMLUBE full synthetic oil is available in 3 viscosity grades- 10W30, 10W40 & 20W50. These organic ester multigrade full synthetic oils are specifically designed to meet the demanding hot climate in Malaysia and Singapore. CHEMLUBE organic ester full synthetic oils meet and exceed API SM-CF, MIL-L-46152B. They are recommended for use in all gasoline and diesel engines. The low sulphur content of CHEMLUBE ester synthetic oil is a highly desirable feature for use in turbo and diesel engines. The inherent characteristics of organic ester synthetics provide for low evaporation rates and strong detergent to keep engines clean of sludge and carbon. CHEMLUBE has the highest viscosity index of 197 giving oil stability for complete lubrication during traffic jams and sustained high speed driving. Engines run cooler with CHEMLUBE. Engines using CHEMLUBE are significantly quieter, have better response and improved fuel consumption of about 10%. CHEMLUBE oil film strength of over 3000psi far exceeds other lubricants. Esters natural affinity to metal provides for an oil film on all metal surfaces over prolonged periods of time and gives easy early morning starts. CHEMLUBE long life synthetic oil is recommended for 40,000km or 1-year oil change intervals in normal driving conditions. Organic ester with its inherent high quality characteristics has proven to be the highest quality base material for synthetic oil used even by aeroplanes. Given the incomparable quality, CHEMLUBE synthetic oil remains committed to the use of organic ester although costs are about 40% more expensive than PAO or hydrocarbon synthetic oil. 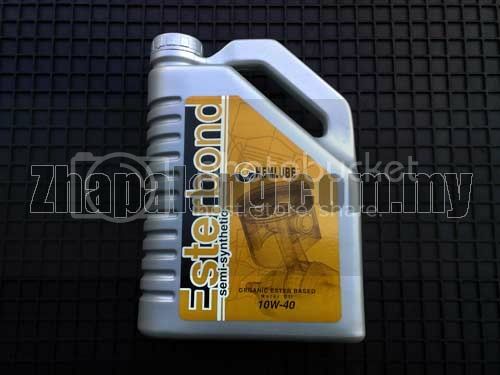 Chemlube Esterbond is derived from the finest synthetic ester based stock. It meets and exceeds the requirement of all car manufacturers. Chemlube Esterbond is specially blended for engines to meet the exacting demands of driving in congested traffic and open highways. Containing less sulphur than most others oils, it prevent the formation of sulphuric acid that results from combustions which accelerates engine corrosion. Bonding of oil to metal reducing friction and noise. Unique metal affinity offers soother engine operations. Easier engine start-ups even after prolonged periods. Keeps engines free of sludge and carbon. Suitable for all engines including turbocharged and diesel engines. Superseding the shortcoimngs of petroleum based oils. Optimizes engines for peak performance.